From his experience as an urban planner during 20 years, James Rojas realized how difficult it was to make unprofessionals participate to urban planning of their city. Urban planning is a field that remains relatively inaccessible from the unprofessionals because of abstract language, reading maps and plans, etc. From this observation, he set up a participative planification methodology. Through workshops, James Rojas aims to understand how to change the planning process and make it more open so that everyone can become an actor in the planning of the urban environment. For him, everyone is an urban planner inasmuch as every inhabitant has a relationship with the city, and uses it in some way. – John Kamp / Runs the facilitation and training portions of workshops, creates policy documents and designs based on the outcomes of the workshops, and designs and maintains the PlaceIt! – The participants of the workshop, mainly residents of the place in question. 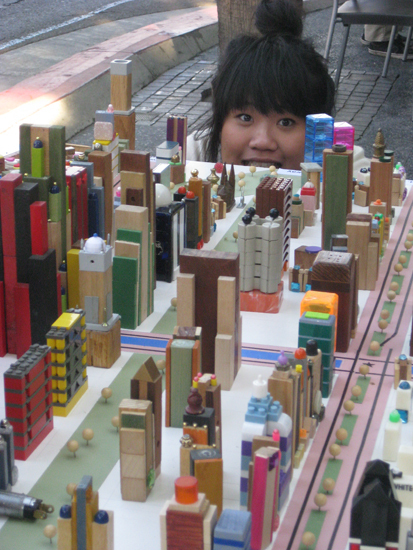 James Rojas’s workshops enable to create city models from small daily items (colors caps, LEGO…). This new model construction invites participants to understand that the physical environment can be transformed. This interactive planning process is a strong learning component. Designing in manipulating objects allows to model the experience of residents and users. James Rojas – Organization : Place It !